by Patrick Meitin The Coues whitetail deer — a Southwest subspecies of the common Eastern whitetail — were first scientifically described by American Army physician and noted naturalist Dr. Elliot Coues while stationed at Fort Whipple, Arizona, 1865 to 1866. Hence the Coues label. “Cows” is technically the proper pronunciation, though most who hunt them pronounce it “cooz.” Locally the deer is often referred to as Arizona whitetail, or “fantail” (due to their habit of flaring their large tails when alarmed). The Coues whitetail is an elfin deer, standing 32-34 inches at the shoulder and seldom exceeding 100 pounds live weight. Coues sport ears and tails appearing out of proportion to their small bodies, with hides generally lighter in hue than other deer species. The large ears facilitate heat dissipation during hot summer months, the grey hide blending remarkably well in their drab, rocky environments. Coues are denizens of Southwestern mountain ranges consisting mostly of scrub oak, Manzanita, mountain mahogany, juniper, piñon pine and high grass bowls, sometimes mesquite and cactus basins, at elevations from 3,500 to 9,000+ feet above sea level (the majority found at 6,000 to 7,500 feet). They are well adapted to these hot, dry regions and can survive long periods without standing water (retaining moisture from the vegetation they ingest), though not indefinitely. Prolonged droughts are the Coues whitetail’s No.1 enemy, and herds suffer during such conditions. Coues whitetail typically began rutting by mid-December, with the first three weeks of January representing the rut peak in most locations. Coues whitetail have been observed rutting into February in some herds. Breeding is timed to coincide with the Southwest’s late-June/early-July monsoon season, fawns generally dropping by late June. Arriving during monsoons assures does and fawns receive adequate nutrition through renewed vegetation growth these summer rains bring. Cooling temperatures that result from these rains are also generally easier on newborn fawns. For decades the Coues whitetail remained a localized big-game animal known only to a dedicated cadre of cult-like followers. That has changed, the new hunger for slams making them more popular with globe-trotting hunters. The late Jack O’Connor, one the nation’s most respected outdoor writers, widely-traveled trophy hunter and long-time Arizona denizen, considered the Coues the most challenging big-game animal of them all, comparing them favorably to African kudu. Stateside Coues deer are pursued in Arizona and New Mexico. Arizona and New Mexico essentially constitute fringe habitats, Old Mexico the real Coues whitetail epicenter. Bowhunting kicks off in August and September in Arizona and New Mexico, respectively, providing opportunities for velvet-antlered bucks (including New Mexico’s September muzzle-loader seasons). Rifle hunts are generally held October through December in these states, culminating in January archery-only seasons—Arizona the entire month, New Mexico the first couple weeks of January. These are largely public-lands hunts available to all; Arizona rifle and all New Mexico tags won only after submitting an early application (deadline June 12 Arizona, March 21 New Mexico) and being drawn through a lottery system. Arizona archery tags are purchased over the counter for much of the state’s better units, with exceptions. Old Mexico is a different world altogether, normally involving outfitted hunts on private lands and a steep price of admission. Deer numbers and trophy quality are excellent on better ranches, but this is definitely the territory of the well-heeled, with quality hunts with a proven outfitter starting at $3,500 U.S. Old Mexico hunts are generally held December and January, with both bows and firearms permitted. Hunting, as a rule, is much easier than in the States, even out-of-shape hunters tagging bucks through road hunting. 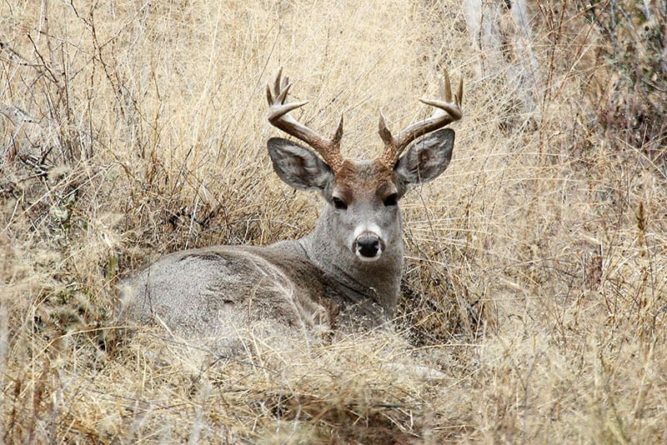 The standard mode of operation in Coues whitetail habitat is spot-and-stalk, staking out a commanding vantage and staying planted for many hours, even all day, glassing for a desirable buck. Coues bucks are fairly territorial, so a single buck sighting or discovery of a trophy-sized shed antler means the chances of seeing that buck again are good via patient glassing. Serious Coues hunters invest serious money in optics, a German-made 10x42mm binocular and variable 15-45x60mm (minimum) spotting scope standard-issue gear, most dyed-in-the-wool Coues whitetail hunters also owning more powerful binoculars in the 15x60mm class, mounted on tripods for tedious or long-distance probing. Shots, whether bowhunting or with firearm, are characteristically longer than average, as Coues whitetail are neurotic creatures, a survival trait instilled by stalking mountain lions with which they share their habitat. Many bowhunters have found Coues success while sitting treestands, particularly while guarding water early. Arizona: The highest concentrations of Grand Canyon State Coues are discovered in the southeastern portion of the state. Populations grow spottier as you move north onto the Mogollon Rim and west to the Colorado River, though isolated pockets found within these parameters can provide worthwhile hunting. For more information, visit https://www.azgfd.com/. 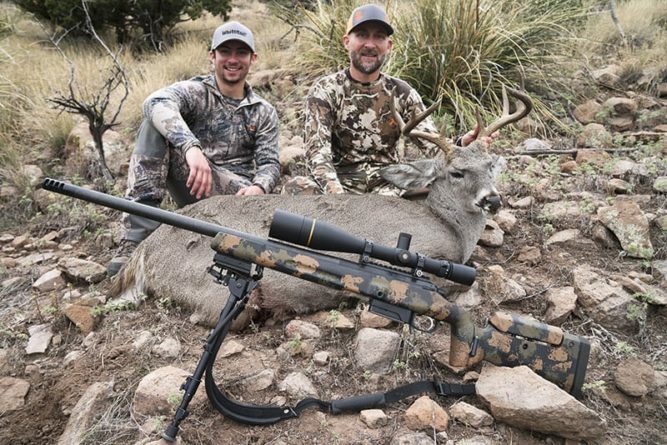 New Mexico: Coues are limited to the extreme southwestern portion of The Land of Enchantment, with the most reliable hunting discovered along the Arizona border south of the Blue Range and continuing to Mexico. Scattered populations of Coues are found in the San Mateo Mountains, northern Black Range and westward through the heart of the Gila National Forest. Northern populations tend to be found in isolated pockets of suitable habitat. For more information, visit http://www.wildlife.state.nm.us/. Mexico: The Coues deer of Old Mexico are most abundant in the states of Sonora and far-western Chihuahua. Sinaloa, Nayarit, and Durango also hold populations of Coues deer, though hunting operations are rarer in these Mexican states. This Coues whitetail scores right at 100″ — a great Coues trophy.